After six weeks and eight state parks along the Oregon coast, we have decided that we’re in L♥ve. The state parks on Oregon’s coast are welcoming, well-maintained and located alongside some of the most gorgeous beaches we’ve ever seen. Instead of a long, rambling post about how much we love these parks, we’ve instead compiled a short list of the top 5 reasons why we love Oregon Coastal State Parks. 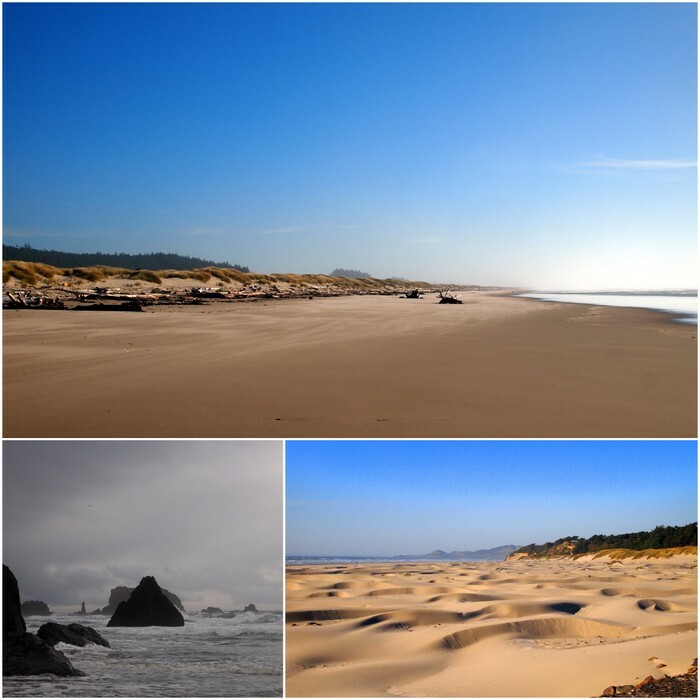 Given that we’ve named this list ‘Oregon coastal state parks’ it seems evident that these parks are located on the coast. What the title doesn’t tell you is just how outstanding this coast is. From long, uninterrupted stretches of pristine beach in the north, soft rolling dunes in the central area, and a rugged shoreline adorned with breathtaking cliffs and rock formations in the south — Oregon has it all. And for your enjoyment, this magnificent stretch of coast is easily accessible from 14 state parks all located just a short walk from the beach. Clearly marked walking, biking and sometimes horse trails lead from the campground to the beach in every park which ensures that you can spend as much time with your toes in the sand as possible. It really doesn’t get much better than this. To claim that Oregon State Parks are a good deal would be an understatement. The low cost compared with what you get for your money makes these parks practically a steal. The price for a typical RV site ranges from $20-$26 during the summer months (May-September) and $16-$22 in the off-season (October-April). What do you get for this price? Well, in addition to the standard picnic table and fire ring you also get a decent sized site and a level asphalt parking pad along with a water, electric and sometimes a sewer hookup. A few parks (the ones we visited were Beverly Beach and Harris Beach) even offer cable hookups. There are no extra fees for pets or not being a state resident (yes, some state parks will charge extra if you don’t live in the state that state -we’re talking about you NY). In fact, there’s not even any sales tax added to the price! Now that’s real value. In addition to wonderful sites in great locations, you can also count on plenty of extra amenities. That funny looking brown cone you see up there? Those are scattered around all the state parks for campers who don’t have a sewer hook up at their site. Since most RV sites have electric and water, but only some offer sewer this is really nice, and often helpful, gesture. 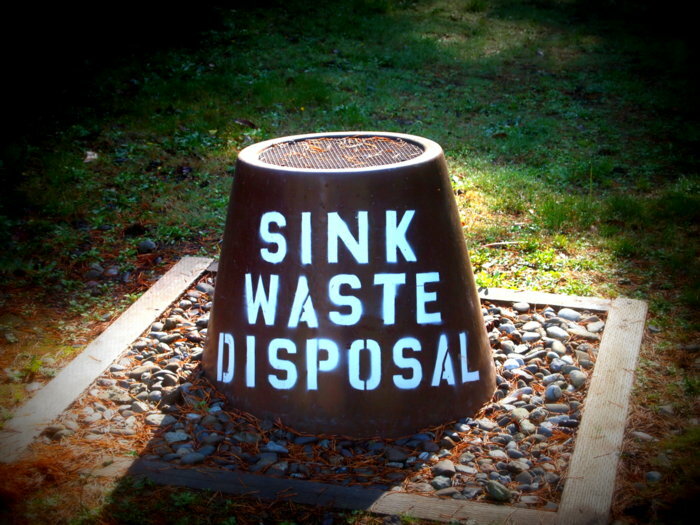 Some of the other amenities found at Oregon state parks are FREE hot showers, clean bathrooms with flush toilets, recycling centers, and information kiosks. A few parks offer extra amenities like on-site historic buildings, playgrounds for the kids, and even a laundromat (the last 2 were found at Harris Beach). Before we started traveling around the country I thought many of these things came standard at most campgrounds. Boy, was I wrong. Unless you’re staying at an expensive private park free hot showers are really hard to come by, many parks only offer pit toilets, and recycling is sporadic at best. The last one really surprised me. In this day and age, not recycling is like not wearing your seatbelt- it’s just plain dumb. We’ve found that recycling opportunities vary greatly from park to park and state to state. We even visited a few national parks that didn’t have recycling. Considering that we paid to get into the park and to stay at the park, I think offering a recycling program is the least they could do, both for us and the earth. Well, I am pleased to report that every single Oregon State park has an extensive recycling center with multiple bins that are clearly labeled. Thank you Oregon! There is no better place to take your dog camping than at an Oregon State Park. 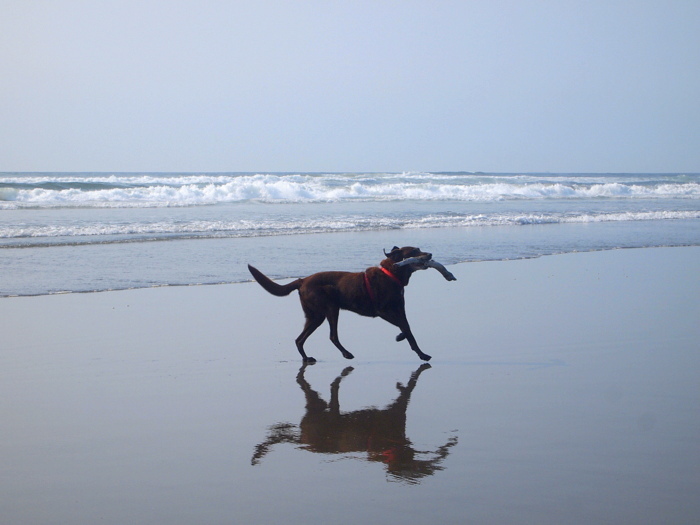 Our nature-loving dog has been having the time of his life racing along the beaches and hiking the trails. He’s been delighted to meet many, many other dogs on the beach and at the campground, and is relieved that we don’t have to pay extra to have him with us (leaves more money in the budget for treats). He enjoys his large backyards and has toiled away many an afternoon snoozing by the camper with one eye open for any chipmunks or squirrels trying to sneak past. Speaking of sneaking past, he has spotted a few of those sneaky (and scary) kitties strutting around the campgrounds on their leashes, so apparently, cats love Oregon state parks too. We struggled to come up with a title for this last one. 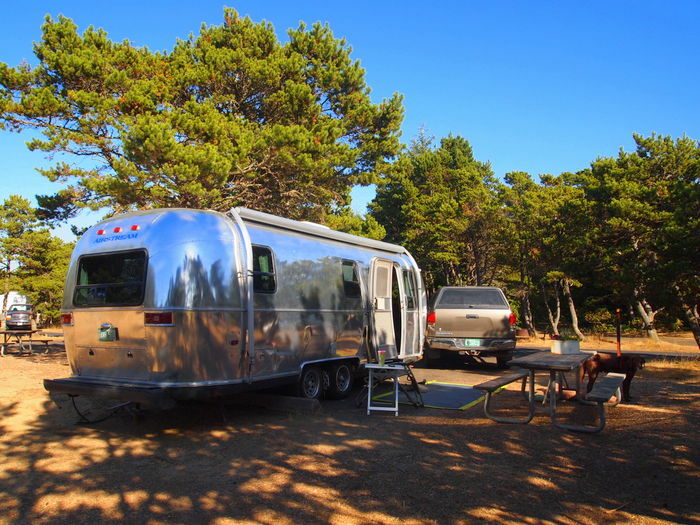 Hospitality sounds a bit like what you might find at a hotel or fancy convention center, and I suppose that’s fitting because even though these are campgrounds we’re talking about, they can sometimes feel like so much more. 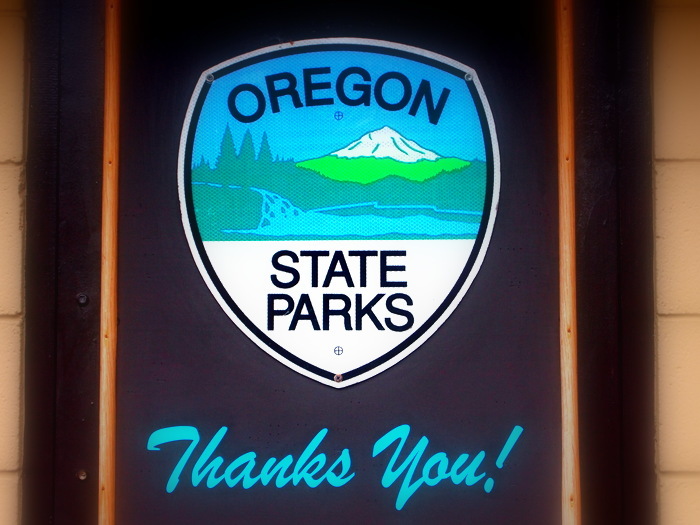 What we’re trying to convey here is just how welcoming Oregon state parks are. From the check-in process, whether with a staff member at the front gate or at the self-check station, to the plethora of friendly volunteer camp hosts, helpful signage and pamphlets, well-maintained roads and trails, convenient check out time of 1 pm, and super clean bathrooms- there’s a sense that you and your visit are important. And who doesn’t like to feel important?